Kayla Wolf - For Shaw Media Student Anna Barcinski practices putting on a shirt with a grabber tool during an occupational therapy classes at McHenry County College on Wednesday, Feb. 8, 2017. Students practiced dressing, eating and using the bathroom during class. 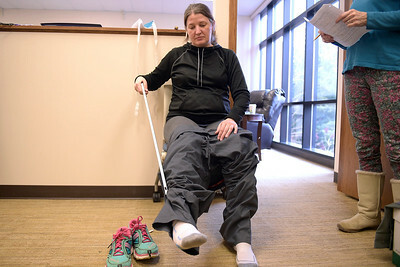 Kayla Wolf - For Shaw Media Peggy Kelton uses a grabber tool to put pants on during an occupational therapy class at McHenry County College on Wednesday, Feb. 8, 2017. Students practiced putting on socks, shirts and pants. 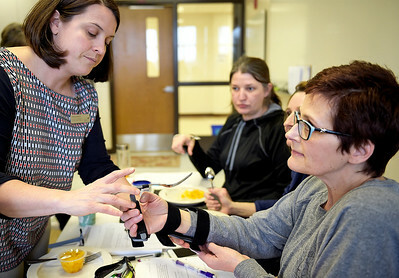 Kayla Wolf - For Shaw Media McHenry County College occupational therapy student Amy Borghardt, center, assists Michelle Hascup (left) with putting on a universal cuff during an occupational therapy class at McHenry County College on Wednesday, Feb. 8, 2017. 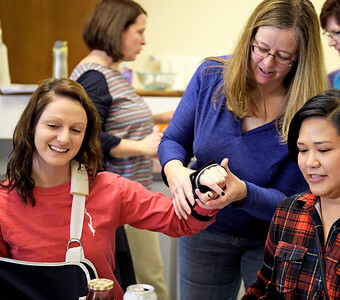 Hascup had to wear a sling for 24 hours as an assignment, as do all of the students, so that they can understand what patients go through. 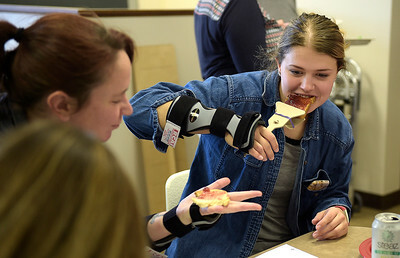 Kayla Wolf - For Shaw Media Students Jessica Tracy (left) and Alyssa Reibel eat toast using sandwich holders during an occupational therapy class at McHenry County College on Wednesday, Feb. 8, 2017. Students were tasked with figuring out how to put jelly on toast as if they were a patient with ALS. Student Anna Barcinski practices putting on a shirt with a grabber tool during an occupational therapy classes at McHenry County College on Wednesday, Feb. 8, 2017. Students practiced dressing, eating and using the bathroom during class.